Description: 100% genuine goat leather with velvet lining and antique look accessories, Size 12'" width x 8" height x 3.5" depth. Well suited to carry mobiles, cash, vanity items and other personal belongings etc. Genuine handmade product made from chemical and dye free leather. Veg tanning using natural edible oil and Sun tanning used for obtaining shades. 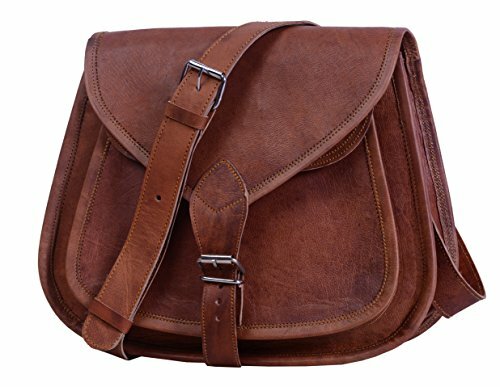 Bag gives a wonderfully unique and antique look with use. A perfect companion and gift for your close ones. Refund: We stand by our product and are very confident of our quality. However if not satisfied a 100% refund will be provided if the product is returned within 14 days of receipt. Buyer pays for return shipping to our Chicago Address. NOTE: GOAT LEATHER IS PROCESSED USING TRADITIONAL TANNING METHODS AND MAY HAVE A DISTINCTIVE SMELL WHICH FADES AWAY WITH USE. ALSO SINCE ALL ITEMS ARE HANDMADE THE REAL BAG COULD VARY SLIGHTLY IN COLOR AND TEXTURE THEN THE PRODUCT PICTURED. 2 inner zipper compartment and 1 back zipper compartment for important documents/paperwork etc.